Customer satisfaction is the key factor when it comes to retail industry be it online or offline; they all have the common goal of delivering seamless customer experience. But, unfortunately not all the marketing efforts hit the target of reaching the right audience; so retailers see beacon technology as strategic approach to boost their agility, hit the right customer at right time and earn customer loyalty. A beacon, in the context of location-based services, is a small hardware device that enables data transmission to mobile devices within a specific range of the device. By deploying beacons in the store, brands can collect data about customer’s behavior and sends personalized push notification to the customer’s device. For instance: Customers can receive “welcome back” messages from retailers when they enter stores or send special offers based on their shopping preferences. Drives conversions: Proximity marketing with beacon encourages purchase behavior and brand relationships and when it comes to retail, beacon hardware serves as a tool for advertising messages as soon as the user’s device comes within the proximity of beacons. 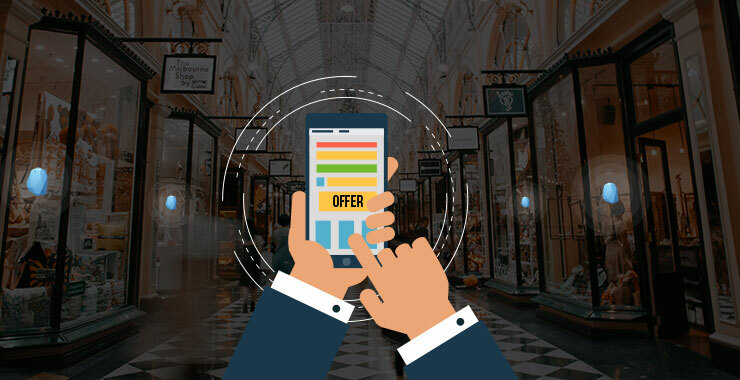 Beacons send relevant offers and coupons to the customer’s phone via mobile app and they are likely to make purchase being in the vicinity of the store; this results in the app retention, app engagement and ultimately drives more conversions. Provides personalized shopping experience: Beacon technology provides data integration based on the shopping history, preferences or demographics which can be extremely valuable for the brand name as well as customer loyalty. This data helps the companies to make better and more meaningful and personalized message for their customers. Based on the shopping behavior – products, deals, coupons etc. can be tailored to the individual customer’s preferences which in-turn provides long term customer loyalty and engaging shopping preferences. Mines data to provide better search result: Beacon technology can integrate beacon data with the data of the user’s mobile device such as contacts or social media interactions and provide more relevant interaction in real-time. With this unique data, search engines can serve better search results based on the current location of the user. Connects with the customer instantly: Beacon acts as a bridge between customers and physical store and hence place targeted messages directly in the hands of the consumer. Customer may not see the ad or may scroll more and ignore the ad on the social feeds but beacons sends push messages directly to the user’s phone and thus ensure increase in app engagement and retention. Relevant offers when sent directly to the customer in real-time can drive them to purchase. Retailers benefits because they can get the data about what products they are interested in and accordingly can offer top-notch coupons and discounts which boost the customers to make purchase at the shop rather later from the online merchant. For consumers, they can get chance to shop at the discounted rates and can have seamless and enhanced shopping experience. Beacons can track customer’s journey which further enhances customer engagement and results in the increased ROI for a business. By targeting right people at the right time location-based app notification boosts customer experience and results in the increased user engagement in the mobile app and drives more in-store sales.